My name is Lisa Crispin and I live in a rural country town on the north coast of New South Wales, Australia. In my home studio, I work mainly in metal, stone and glass. I also love working with chain maille and producing precious metal jewelry incorporating natural gemstones. When making my flame worked glass beads I use a Carlisle Mini CC with a 5 lpm oxygen concentrator. I work mainly in soda lime glass (Effetre, Vetrofond, Czech, Gaffer, Reichenbach) but occasionally venture down the road of Borosilicate glass. My favourite style is organic and I am obsessed with swirls and plunged dots! My work has been published in beading magazines and has gained worldwide recognition. Local Art Galleries exhibit my work as well as one retail outlet. Although I have had no formal training, I have educated myself through books, DVDs and the internet in my areas of interest. This results in an eclectic mix of fashionable jewelry. BHB stands for Big Hole Beads. This simple lariat necklace was made using 3 of my own Big Hole Beads with sterling silver cores. Take a 1 metre length of leather thonging and tie a knot very close to each end. Double it over and thread (alternately) 3 large hole silver spacers and 3 BHB onto the doubled strand, pushing all the beads down to the knots. Thread 2 more large hole silver spacers onto the doubled strands. These two spacer serve as the "locks" when you form the lariat. Pass the end with the beads through the loop after the last spacer. Place the end loop between the first and second spacer on top of the glass beads and use the last spacer to "lock down" the loop. The lariat can easily be secured by the wearer in front of the neck, making it ideal for those with arthritic fingers or motor skill problems. 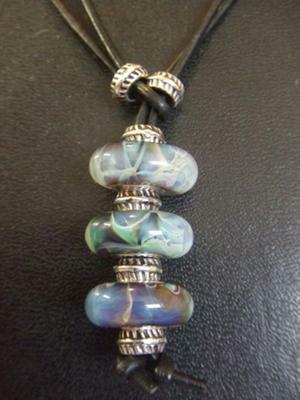 Please visit Lisa at her web site Passion For Flame Jewellery to see lovely examples of her work.